If you have a child under the age of two, then you know how quickly they can move around. This can be dangerous for a toddler, especially when a mere moment can have them crawling to the top of a staircase. To help keep your child safe from danger, a baby gate may be required. It is a great tool to help you keep your child in a certain area of the home where they will not get into trouble. It provides a safe environment for your child while you are preparing their lunch, but which best baby gate is good for your baby? How do you know that the baby gate you choose will not be able to be opened by your toddler? Safety is always a primary factor, so consider what features your baby gate needs, and take a look at the top picks that we’ve included in this guide. 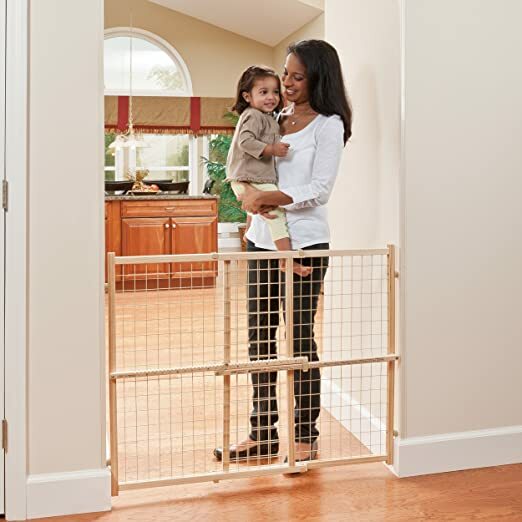 Our gold pick, which is brought to you by Summer Infant, is an extra tall walk-through gate that is designed to be a durable option for protecting your children from harm. The company has been making devices to keep babies safe since 1985. They create bath time tubs, potties, and other accessories such as strollers and gates. This baby gate is one of the quality products created to make parents and babies happier. This Summer Infant baby gate is designed to be a versatile option for parents. It can be used in any doorway that ranges between 28 inches and 48 inches wide as well as at the top of a staircase. If the base of the unit is not long enough to reach both walls, there are two four and a half inch extensions included as well as a six-inch extension for your use. The unit is designed so that it can be pressure mounted in doorways or it can be secured with screws and other provided hardware if you prefer. If you are placing this baby gate at the top of the stairs, then it is advised that the hardware mounting option is used to ensure your child’s safety. Many small children love to climb, especially those who have just hit the toddler age. This gate is designed for children who are between the ages of six months and two years old, so to accommodate the height of your child, the company designed this baby gate to be extra tall. In fact, it is a full 36 inches high, so there is probably a very slim chance that your youngster will try to climb over it. When it comes to the aesthetics of this best baby gate, you will notice that it features an all-metal construction that is built to be durable and designed to last for a long period of time. In addition, it is completed with a beautiful bronze finish that will look great in any room of your home, but especially in your main living area. If you prefer a different look in your home, you can also purchase this product in a beige color. The door of this baby gate is designed to be easy to use, even when you only have one hand available. It can be opened in either direction unless you place the gate at the top of the stairs. If you are securing the staircase, then make sure that you attach the removable door stopper that is included to ensure that the door can only open in one direction. The lock on the door is a dual locking system that is designed to be safe and secure. In addition, if your hands happen to be full, then you can simply walk through the gate, and it will automatically close and lock without any assistance from you. Regalo is a company that is determined to create and stand by safe and simple to use products that offer security to the most precious people in the word, which are our children. They strive to manufacture products with high standards that will make both mommy and daddy proud to stand by a Relago product. Our silver pick is a baby gate that has all of the safety features you need as well as the style and looks that you deserve to have in your home. This gate is designed for children who are between six months of age and three years old, so you can imagine that it has to be extra tall to accommodate those curious youngsters from climbing over the top and injuring themselves. In fact, this is the tallest baby gate on our list, and it stands 37 inches tall. The gate is designed to be used in any doorway or stairwell, so it is able to fit in an area that is anywhere between 29 inches wide and 44 inches wide. If the edges of the gate are still not long enough to reach the walls, then there is a four-inch extension and a six inch extension included. The all-metal frame of this baby gate is designed to beautifully accent any home; in fact, there is even a hardwood cherry accent that is on the gate to add some style to a gate that is being used for its functionality. This gate features an easy to lock handle that can simply be pushed shut. Once it is latched, you will need to slide the push button lock forward to disengage the walk-through door from the gate. It is a bit difficult to press, but it is designed to be difficult for a toddler to open themselves. The gate can be mounted on the wall using the hardware that is included in the packaging, or it can be set up using the pressure mounting system if you prefer. The set up that you use will often depend on where you are placing the gate. For example, if you are placing the gate near the stairs of the fireplace, then you will most likely want to secure the baby gate securely in place. Another important aspect of this baby gate is the fact that all of the parts of the unit are designed to be PVC free, which is a concern that some parents will consider before purchasing a baby gate for their child. Having a baby gate is great for a toddler, but what if you have furry babies that you need to secure as well? Our bronze pick is a great option for separating your toddler and your dog in two separate rooms, but it has a small door that will allow your cat to go between both rooms. This gate is designed to help you keep track of all of your babies with ease. The Carlson Extra baby gate is designed to accommodate doorways and walkways that are between 29 inches wide and 34 inches, which means that it will fit without an issue in most homes. There are also attachments included in the packaging to extend the width of the gate by either four inches or six inches, whichever you need to accommodate the space. Since you can add a few attachments to each side of the gate, you will be able to cover a fairly large area if you desire. When it comes to the height of this baby gate, you will notice that it is slightly smaller than some of the others mentioned on this list, but it is still 31 inches tall, which is a good size for most toddlers. The gate is designed to be pressure mounted in place with the included attachments, so it will be stable and secure in the event that a youngster decides to try to push their way through the gate. It is designed with a full steel construction that will last for years. 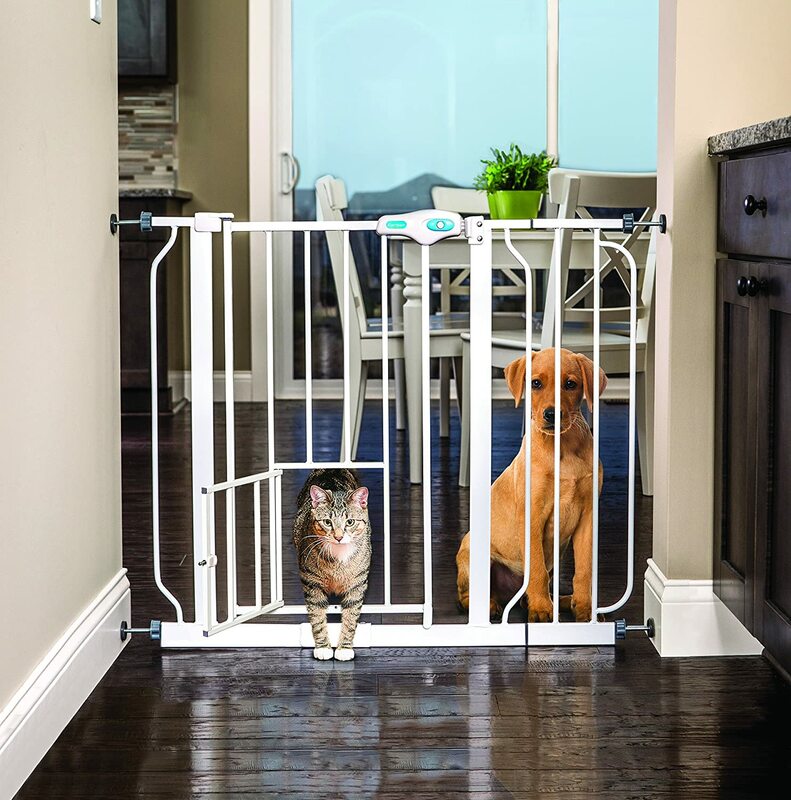 The one feature about this baby gate that is unique to this model is the fact that it includes a pet door that can allow your cat or small dog unlimited access to the rooms on either side of the gate. The only concern with this feature is the fact that if your child is small as well, they may try to squeeze through the small doorway and end up getting stuck or injured in the process. If you have a child that is adventurous, they may find a way through the door, which will defeat the purpose of the baby gate altogether. If your child can fit through the pet gate, then you might want to keep the door secure until they are a little bigger. Your cat will find a way around the gate if they need to get into the other room, your baby’s safety is more important. This baby gate is designed with a double locking design that has a red safety lock on top of the latch. The level will lock in place as the gate is closed, but there is an additional safety lock that you press over the latch to secure it. This makes it more difficult to open, but little fingers will not find their way under the latch. When it comes to the reviews of this product, you will find that there are well over 3,000 posts rating this gate on Amazon. 83 percent of the reviews were given a positive four or five-star rating, and surprisingly enough, just as many pet parents use this product as actual parents who have a human child. It is a safe and secure device that conveniently has an access door for smaller pets to use, so it is a great addition to a family with small children as well as small pets. Babies can be expensive, especially if you are a first time parent who is inclined to purchase all of the top brands for your youngster. If you are a little lighter in the pockets than normal, but you want to find a baby gate for your home that is safe and secure, our budget pick may be for you. Evenflo has been rooted in infant care since 1920, and it continues to make quality products today. This Evenflo product is the number one selling gate in the United States currently, and it is a great device to use to secure your child in a specific room. This baby gate is designed to be placed wherever you need it to be and easily locked into place. It is designed to accommodate spaces that are 31 inches to 50 inches wide, which means that it will be able to reach the walls in most hallways. It is designed to be a full 32 inches tall, which is perfect for most children between the ages of six months and two years old. This Evenflo baby gate is made with a wooden frame and plastic mesh material that is designed to secure your child. It features a pressure mounted system, so the sides are fitted with rubber bumpers that will reduce the wear and tear that your wall receives. The gate comes preassembled, so you do not have to work about getting your tools out to make adjustments or to attach the gate to the wall. It is a lightweight option that can easily be moved from room to room as you need a different area of the home to be secured. In fact, it is one of the best baby gates for taking on trips when you visit family members or friends. The bar that locks the gate in place can be adjusted easily by measuring the size of the doorway and then placing the latch in the notch that will fit the space. The only caveat regarding this baby gate that you may want to consider is the fact that it can easily be lodged out of place. For this reason, the manufacturer does not recommend that parents use this baby gate to secure the top of a staircase. These types of the best baby gates have a support frame that screws directly into the wall. They are extremely sturdy options that are fixed in place once they are installed. There are often doors that open on these types of best baby gates since they cannot easily be removed and stepping over them constantly could be dangerous. These types of the best baby gates use a retractable lever to securely lock the gate between two walls. These styles can easily be removed at any time, but that also means that this type of baby gate may not be as sturdy as you need for some active toddlers. The width of your selected baby gate will depend on the amount of space that is between the walls where you wish to place it. So decide which size is best for you, and remember that there are always extensions that you can purchase to accommodate your room size. The height of the baby gate that you select will depend on how tall your toddler is. Most of the best baby gates range between 22 and 26 inches in height, but you can find taller baby gates that are 30 inches tall or even up to 40 inches in height. Make sure that you select a height that will be appropriate for your child throughout their years as a toddler, not one that they can easily climb over before they are two. Latches are an important aspect of a baby gate. You need to make sure that you can easily open the latch with one hand, but they also need to function as an impassable latch for your young ones. Some of the best baby gates simply lock down into place, while others are designed with a dual locking system that provides extra protection. Decide which type of lock is best for your household. Also, make sure to consider if a gate with a door is more convenient than a gate that you simply step over. Each type has its advantages, so choose based on your specific needs. No matter what type of baby gate you decide to purchase, you need to make sure that it is easy to install. Most of the best baby gates, even gates that you install directly onto the wall should not take you more than 30 minutes to set up. You also need to make sure that the gate is easy for you to traverse; meaning that it is easy for you to get to the other side of the gate with one hand for those times when you are carrying something or someone in your arms. A baby gate will most likely become part of the décor of your home, at least for a few years, so having a unit that matches the area that it will be seen may be important. Some of the best baby gates are made of plastic, some are made of a metallic material, and others are made from wood. Find the design that you like the most to secure your baby; there is a design to fit everyone’s taste. In fact, there are even options to have baby blue or soft pink baby gates to match the nursery if you desire. Some of the best baby gates have additional features that you may wish to consider having before you make a purchase. One feature that addresses safety is a latch indicator, which is designed to let you know if the baby gate is not latched properly. Most gates feature a red LED light that will glow if the gate is not latched; this makes it easy for a busy parent to make sure that the gate is secure. Another feature that a parent may want to consider only applies to families that have pets. 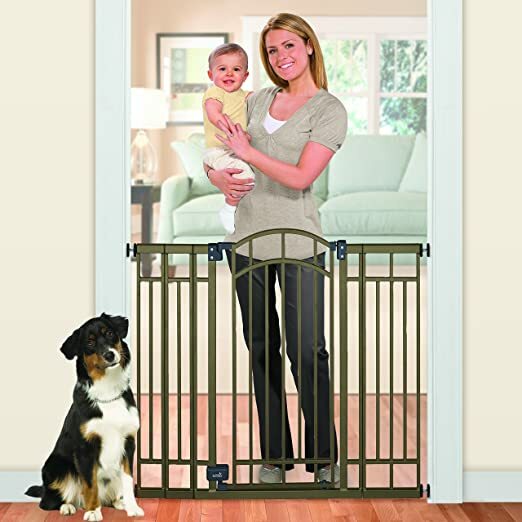 There are some best baby gates that have walk-through pet doors that are included in their design. This means that when you want your child to stay in a certain area, your pet will be able to roam freely throughout the home. This can also be a temptation for curious youngsters, so make sure that your child cannot fit through the pet door. Conclusion: Which baby gate is the best for your baby? Having a baby gate is a great way to make sure your child is in a safe area of your home, which will allow you to relax and have peace of mind when you need to take your eyes off of them for a minute. It can be a great way to encourage playtime in the nursery, a way to keep them away from the staircase, and a way to keep them away from dangerous areas of the home, like a fireplace or a location where cleaning chemicals are kept. Once you know where you need to place a baby gate, then you can take measurements and decide which additional features you want. Take a look at our gold through bronze picks as well as our budget option before you decide which is best for you.